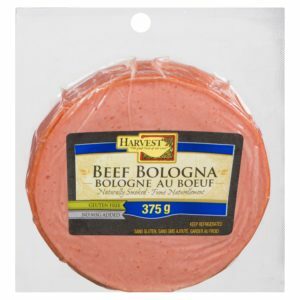 Our Bologna boasts a flavourful taste and aroma combined with a firm texture. This unique combination is achieved by using only top quality cuts of beef, along with spices including a high quality milk binder. There are no mechanically separated or mechanically de-boned meats, no by-products and no soya or plant extenders are used. As well, it contains no added monosodium glutamate. It is smoked using the old fashion technique of natural wood chips instead of artificial chemical sprays or dips.